I've always been a breakfast eater. My mom always made sure we ate breakfast, even if it was cake or brownies (that wasn't her first choice, obviously). Healthy options were in the house, but my dad and I were both picky and once in a while she let us eat cake just to make sure we had breakfast. She knew that we needed something to start off the day. Thankfully, I've grown up a little and make better options now! 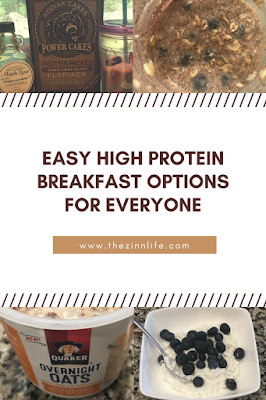 I've been trying to find ways to increase my protein and fiber intake, especially since finding out I was pregnant and one of the easiest ways is to knock it out in breakfast! Not everyone is a big breakfast eater, I get that. Also, who has time for all that work in the morning?! I don't. 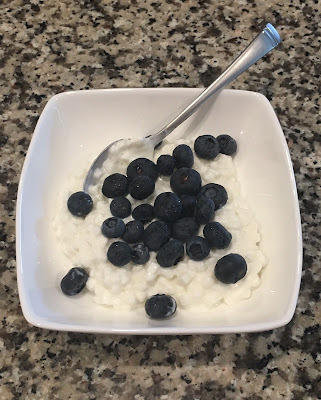 When I did Whole 30, breakfast was the hardest for me because I couldn't do anything processed or packaged, which meant a lot of planning and prepping. I learned a lot from that experiment and from others along the way and I wanted to share! This post is organized by the breakfast eater - the I don't want a lot, the I like to eat, but don't have a lot of time, and the I'll plan ahead and make it work eaters. Some people just don't like breakfast. Get it. Totally. But you still need something, so here are a few ideas. These breakfasts all take less than 3 minutes to make and can beat eaten in the car (some more easily than others) or at the office. Some of these are actually my afternoon snacks at work! Funny story - for years, I only like cottage cheese off a salad bar. Weird, I know. I just didn't like what I found in the grocery stores. But then I found Daisy Light Small Curd cottage cheese and it tastes just like the stuff on the salad bar! So good! For my snack, I just do the shake, but for breakfast you might need a little more, so I threw in a banana! These are my favorite shakes that I have found. They taste really good, not chalky and pack a good amount of protein and fiber. And best part, because they aren't a mix, you don't have a chance of hitting those nasty powder clumps! I really like the strawberry and the milk chocolate. One protein shake and a banana is 295 calories, 16 g of protein and 5 g of fiber. You guys are my people. This is where I live. I don't want to spend a lot of time on my breakfast, but man I like to eat! Especially now, I wake up hungry and need to eat right. then. It gets ugly otherwise. These breakfasts are either a make ahead or are out of the freezer. Either way should be quick in the morning and filling! These are a packaged product that you can find in your grocer's freezer. I like them because they give me the same product as the one you make yourself (see below), but without all the prep work. I also think that they retain their texture a little better than the homemade ones. I prefer to get the bacon and spinach, but there are multiple varieties. They are a little expensive at $5.99 for a box of 3 packs, but you can get them for $11.99 at BJ's for a box of 7 packs. I also wait until they go on sale and buy 3 or 4 boxes at a time. 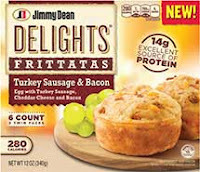 For a pack (2 frittatas), they are 260 calories, 14 g of protein and 2 g of fiber. 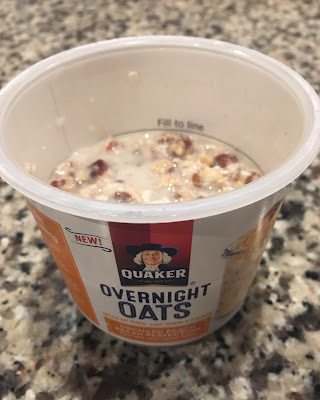 Overnight oats is the thing that I want to love, know that I should love, but I don't. Not really. However, they are the answer to breakfast on mornings that I go to the gym before work. It took me a while, but I finally found a recipe that actually works for me. Also, overnight oats don't photograph well. They just look gross. Put it all in a mason jar (1/2 pint works the best for mixing, use wide mouth for easy eating!) and shake. I like to shake and then stir to make sure the blueberries are evenly distributed and all the chia seeds aren't stuck together. I loaded this recipe into the My Fitness Pal app and it's 385 calories, 13 g of protein and 28 g of fiber. That takes of your entire fiber intake for the day! If you don't feel like purchasing chia seeds and protein powder (they're expensive), you can get a premade overnight oats version! 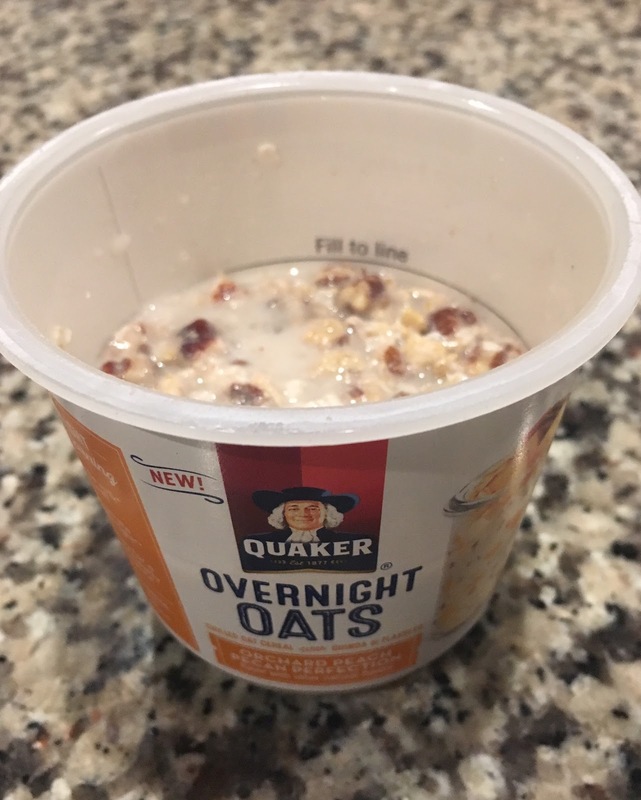 Quaker Oats now has overnight oats you can buy and just add milk to. For comparison, the Blueberry Banana and Vanilla Bliss version prepared is 290 calories, 10 g of protein and 5 g of fiber. You're my hero. These are some of my favorite breakfasts, but I rarely make them because they take time. 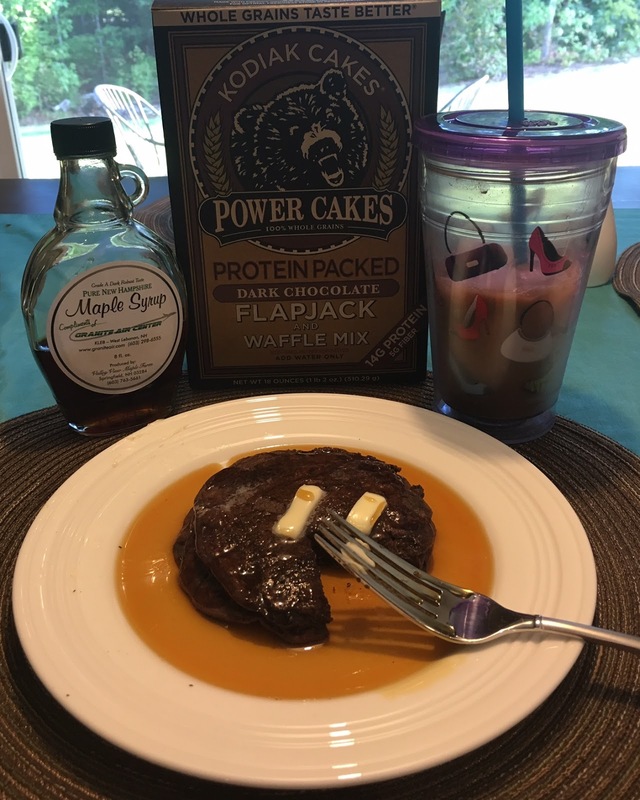 The hash is a concoction I came up with during the Whole 30 (I haven't made it in a while, so no photo) and the pancakes I discovered from a friend. Both are awesome breakfasts and, with a little planning, you can make once and eat off for another few days. There is not set recipe for this. I pretty much use it as a "what's in my fridge" clean-out exercise. This also makes enough to feed us for about 2-3 days. But your basic ingredients are potato, meat, maybe some vegetables and egg. My favorite is below. For the potatoes, I scrub and grate them the night before. You can also cube them, but I like to grate. It makes cooking in the pan a lot easier. The large side of a cheese grater makes the perfect size. If you cube them, then I would roast them while you cook the meat. If you cube or grate white potatoes the night before, make sure you store them in water so they don't come out black. They oxidize if left in open air. Sweet potatoes are fine just in a bag. In the morning, I heat a skillet to medium high. Add in your meat. I don't use oil when cooking the meat. I like to leave the sausage sliced or you can cube it if you want a piece of sausage in every bite. Once the sausage is cooked, remove to a plate and keep warm. This is where your judgement comes in. If there is already some grease in the pan from the meat, use that. Otherwise, add in 1 tablespoon olive oil and dump the grated potatoes in. These will take a while to cook. You want them to get a good crisp edge on them, so I cover the whole pan in them and leave them there for about 4 to 5 minutes. Then you can turn/stir them. Once they are mostly cooked, add in whatever vegetables you want to use. I'm not a big veggie in the morning fan, so I don't add them. Once everything is cooked, push is all to the side and created a whole. This is where you add your eggs. I like over easy eggs. So I add two eggs at a time, let them cook and then flip when the egg white is mostly opaque. I remove the eggs and then add another two eggs and do the same. If you scramble, you can add your scrambled eggs all at once in the whole and then scramble from there. For hash with over easy eggs, divvy out your servings (I normally get four to six out of this recipe), then add the egg over each one. If you do scramble eggs, then mix the eggs in to the hash and then divvy out. I like to package each serving individually so I can grab and go (and have portion control). You'll need to load whatever you make into a nutritional calculator for specifics, but I calculated this recipe using sweet potatoes, a 4 link package of chicken apple sausage, 1 tablespoon olive oil and 4 eggs and it came out to 303 calories, 16 g protein and 3 g fiber. My friend Jess introduced these to me when I told her I was trying to eat more protein. So far, I've only tried the dark chocolate but man are they good! Also really easy - you just mix one cup of mix and one cup of water and then heat a pan and make pancakes! You can also make muffins with them, which I haven't tried. This past weekend, I made a double batch of pancakes, which made 5 servings of 4 pancakes each. I did 4 because mine came out pretty thin. Four pancakes is filling for both Aaron and I. These are great with some maple syrup! Best part, I already have my individual packs ready to go for 2 more days! Woo! 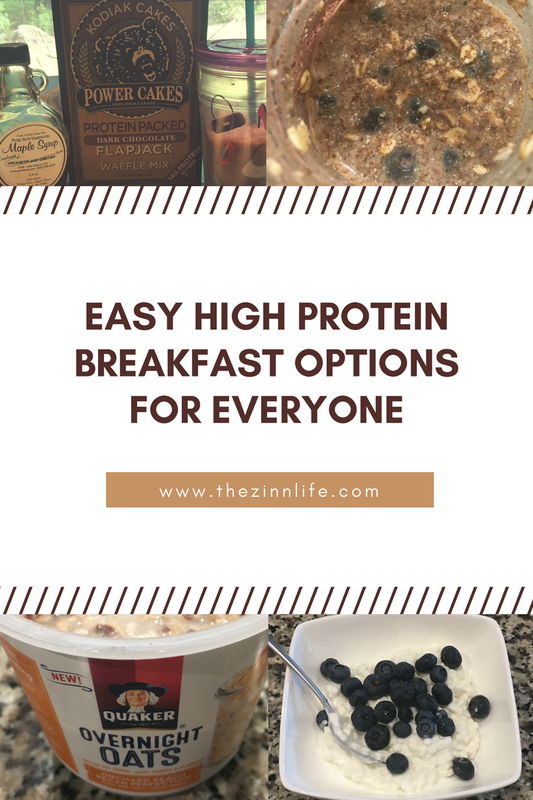 No matter what your breakfast style is, you now have no excuses for not getting some protein in! Another fun way to get protein in for breakfast are smoothie bowls. I haven't tried them, but they are all over pinterest and Instagram. What's your favorite high-protein breakfast? !